Figure 1. Each year, the GIA booth at the GSA exhibition hall attracts participants from all over the world. 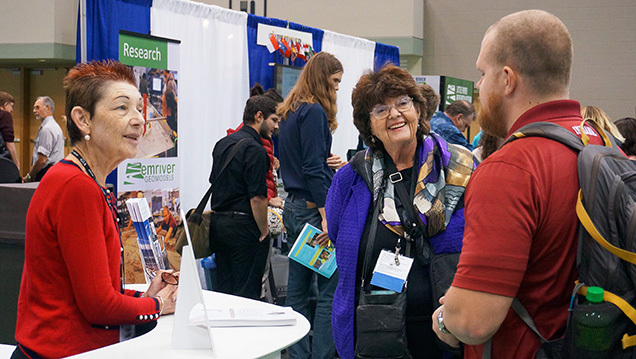 Here, Paula Rucinski (left) and Dona Dirlam (right) speak with a visitor to the booth. Photo by Cathy Jonathan. 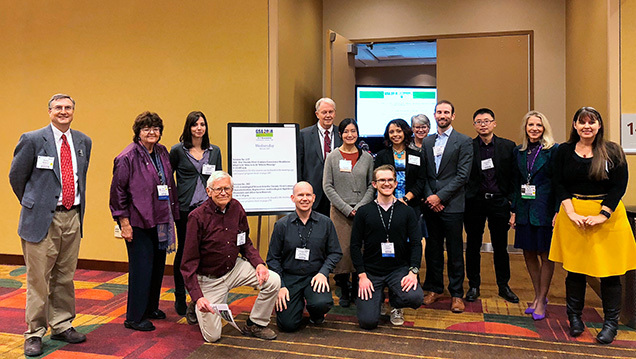 The Geological Society of America (GSA) annual meeting took place in Indianapolis November 4–7. GIA participated as both exhibitor and technical session holder. In total, 21 presenters reported new findings on a broad range of research topics. The GIA booth and the two technical sessions attracted a large audience with an interest in gemology (figure 1). Figure 2. Richard Berg from the Montana Bureau of Mines and Geology presented his poster on Montana sapphires at the GSA annual meeting. Photo by Tao Hsu. The “Gemological Research in the 21st Century” technical program included both poster and speaker sessions. Seven posters were presented on the second day of the conference (figure 2). Kyle Tollefson (Louisiana State University) and Phillip Ihinger (University of Wisconsin-Eau Claire) reported their characterization study on watermelon tourmaline. Their spectroscopic measurements showed that the chromophores Fe and Mn correlate to green and pink colorations, as expected. The infrared spectroscopy and microprobe analyses showed similar trends of hydroxyl occupancy on the V site in this type of tourmaline. Nikita Kepezhinskas (University of Florida) presented the results of petrographic, geochemical, and isotopic analyses of moissanite and diamond from the shoshonite dike in eastern Finnmark, Norway. The shoshonite host of these minerals is a type of Mg- and K-rich basaltic rock, which is indicative of a subduction-modified mantle source. This study proved that carbonate recycling into the lower mantle through subduction, followed by the formation of superdeep diamonds, moissanite, and other carbides, plays an important role in the global carbon cycle. Paul Johnson and Kyaw Soe Moe (GIA, New York) showed an unusual find of a natural diamond with a cuboctahedral growth habit. This diamond should alert gem labs to the fact that cuboctahedral growth does not occur just in HPHT synthetic diamonds. This special diamond also indicated a potentially very interesting and uncommon growth history before it was lifted to the surface of the earth. 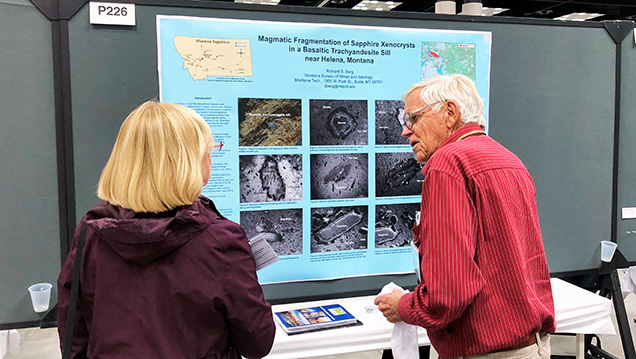 Richard Berg (Montana Bureau of Mines and Geology) described significant magmatic splitting of sapphire xenocrysts in basaltic trachyandesite sill. Through extremely careful examination of in situ sapphires in their host rock and advanced instrument analyses such as SEM, XRD, and EDS, he was able to assemble a sequence of what happened to the sapphires before emplacement into their current location. Ying Song (China University of Petroleum) introduced a newly designed and developed computer-vision based intelligent RI measuring system. This system aimed to enhance the clarity and efficiency of RI and other optical measurements. Classroom demonstration, rapid crystal identification, optic axis characterization, and crystal orientation determination are the four modes currently implemented in this instrument. Ziyin Sun and coauthors (GIA, Carlsbad) displayed their study on chromophore strength in pyralspite garnet. Since multiple color-causing elements work singularly or together to color garnets, the authors isolated each of them and performed quantitative study by experimenting with various combinations of these chromophores’ UV-Vis-NIR spectra under different lighting conditions. Aaron Palke and coauthors (GIA, Carlsbad) reported on a Montana sapphire study aiming to unravel its gemological mysteries. Based on their inclusion and geochemical study, the authors proposed a new model of sapphire formation through peritectic melting reactions during partial melting of an Al-rich protolith. Figure 3. Presenters, guests, and advocates from the GSA poster and speaker sessions. Left to right: Peter Heaney, Dona Dirlam, Mandy Krebs, Richard Berg, Mike Breeding, Jim Shigley, Tingting Gu, Tyler Sundell, Rachelle Turnier, Nancy McMillan, Evan Smith, Chunhui Zhou, Barbara Dutrow, and Sally Eaton-Magaña. Photo by Tao Hsu. This year’s speaker session attracted 14 presenters from multiple research institutes and universities (figure 3). Mike Breeding (GIA, Carlsbad) kicked off the session with an overview of colored diamonds formed at different depths within the earth. He elaborated on the defects that cause diamond’s blue, pink, yellow, brown, and green colors. The audience was given a grand tour of colored diamond formation, from the transition zone all the way to the surface of the earth. Next, Sally Eaton-Magaña (GIA, Carlsbad) presented her photoluminescence study on pink diamonds based on GIA’s uniquely large database. She explained the cause of pink color as a 550 nm absorption band and explored the difference of pink coloration in various diamond types. She also showed some visual clues that can help to separate pink diamonds from different sources. Tyler Sundell (Missouri State University) talked about the feasibility of using time-of-flight secondary ion mass spectrometry (ToF-SIMS) to image diamonds, especially on their trace-element composition and isotope analyses. Evaluation of this method focuses on its spatial resolution and analytical precision. Results show that this method lacks the precision to quantify carbon isotope values. Karen Smit (GIA, New York) presented her research on natural black diamonds found in the billion-year-old Marange conglomerate (Zimbabwe). Diamonds from this source are full of fractures and can be easily treated to achieve a more valuable fancy black color grade, which makes identification challenging without characterization of the natural stones. Visual observation of graphite grain size and the detection of methane associated with the micro-inclusions are necessary to distinguish between natural and treated Marange diamonds. Evan Smith (GIA, New York) delivered his research on carbonatitic melt inclusions he discovered in partially healed cracks within a CLIPPIR diamond (for more on these diamonds, see Winter 2017 G&G, pp. 388–403). The characterization of these inclusions is consistent with carbonatitic melt, providing direct evidence of this melt’s existence at mantle depths. Russell Harmon (North Carolina State University) evaluated the potential of handheld laser-induced breakdown spectroscopy (LIBS) to identify garnets associated with kimberlites, the host rock of most diamond deposits. This study aims to test whether this instrument will help diamond exploration in the field. Initial results showed that it works very well on garnets from the South Africa kimberlite field but not as well on some other samples, especially those from extensive solid solution. Rod Smith (Geological Survey of Canada) presented field and lab research on the Banks Island region in the western Canadian Arctic, aiming to find promising diamond-bearing kimberlite. Based on newly found stream sediments and till samples, geothermometry data, and Lu-Hf geochronology results, the research group demonstrated the need to continue the search for potential diamond-bearing kimberlite in this region and presented a potentially unknown kimberlite glacial dispersal model. Tingting Gu (GIA, New York) talked about inclusion studies on type IaB diamonds. This study offered the first piece of evidence that hydrous phosphate can subduct to the depth of the transition zone. It also showed the first ringwoodite found in diamond, which proved that this diamond formed in the deep mantle. The second half of the speaker session started with Mandy Krebs (GIA, New York), who showed the application of Sr-Pb isotope data to colored gemstones’ country-of-origin determination. The analyses were done by thermal ionization mass spectrometry (TIMS) to precisely measure the Sr-Pb isotope compositions in gem corundum for the first time. The separation is promising for certain sources but less so for others. Rachelle Turnier (University of Wisconsin-Madison) used Raman spectroscopy to evaluate the depth of zircon inclusion formation. These zircons are inclusions in corundum sourced from different deposits. Her study is based on an ideal linear upshift of Raman band of zircon with increasing pressure. However, many other factors can influence this ideal situation, such as radiation damage, stress, and internal heterogeneity. With careful consideration of these influencing factors, using Raman as a zircon barometer can help to distinguish corundum from various sources. William Nachlas (Syracuse University) presented the three different formation mechanisms for rutilated quartz. These include the overgrowth/entrapment mechanism, the precipitation mechanism, and the grain boundary migration mechanism, each with different relative timing of quartz and rutile growth. All three mechanisms were reproduced with well-designed experiments. Peter Heaney (Penn State University) explored the reason behind the striking iridescence displayed by some ochre-colored botryoidal goethite. Dr. Heaney applied focused ion beam (FIB) milling and scanning electron microscopy (SEM) to zoom in on the internal structure of this gem. With these powerful tools, some subsurface void layers were revealed to be responsible for the angle-independent iridescence. The origin of these voids remains a mystery. Barbara Dutrow (Louisiana State University) reported a geochemistry study on some uncommon tourmaline + corundum–bearing rocks from Afghanistan’s Badakhshan Province with randomly oriented phlogopites as the matrix. Major, minor, and trace elements were measured with electron microprobe and laser ablation–inductively coupled plasma–mass spectrometry (LA-ICP-MS). The results indicate the involvement of boron-bearing fluids at the beginning of tourmaline growth and continuous infiltration of this fluid. The bulk composition of this rock is consistent with metasomatism of a clay-containing metacarbonate rock with a metamorphic overprint. Chunhui Zhou (GIA, New York) gave the first-ever pearl presentation in this technical session. Three American freshwater cultured pearls were sliced open and their oxygen isotopes were analyzed using SIMS, aiming to reconstruct the ambient water temperature when the nacre formed. This method is very useful in terms of growth cycle determination and can potentially shine a light on pearl origin determination. Tao Hsu is a technical editor of Gems & Gemology at GIA in Carlsbad, California. Experts shared the latest research on gemstones at the Geological Society of America annual meeting in Seattle.